The two humans created for the second set of Planet of the Apes figures are based very closely on the television series actors. 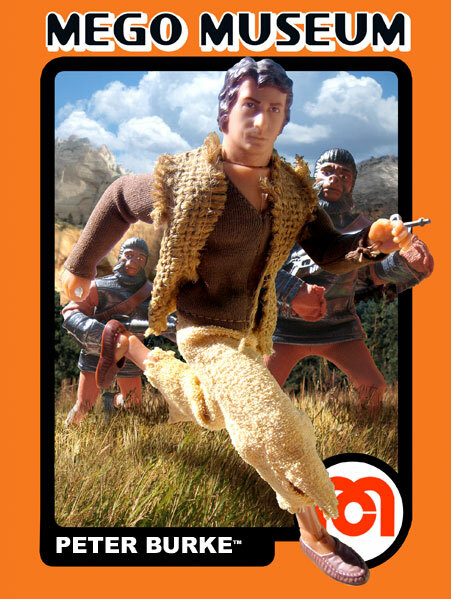 Mego made terrific representations of James Naughton, who played Peter Burke, and Ron Harper, as Alan Virdon. 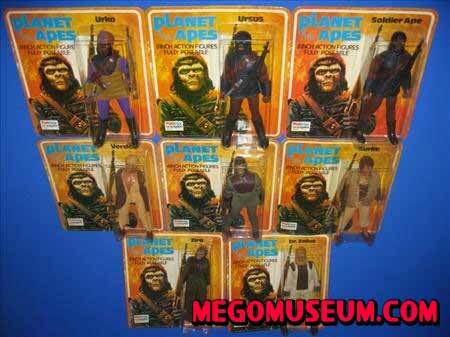 Like all of the figures in Mego’s POTA line, these characters are found on both Type 1 (metal joint) and Type 2 (plastic joint) bodies. Burke and Virdon wear identical terrycloth pants and the same brown or burgundy moccasins worn by both Cornelius and Galen. Peter Burke wears a brown stretchy pullover shirt and a burlap vest. 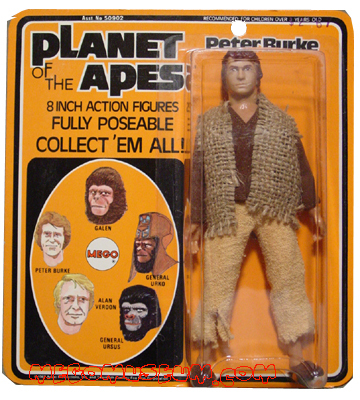 Peter Burke was released on a second issue Palitoy card as seen in this picture from Mike Jimenez. Burke wears the same moccasins as Cornelius/Galen, Alan Verdon, Starsky from Starsky and Hutch and some figures in the Western line. They come in various shades of brown and burgundy tones. 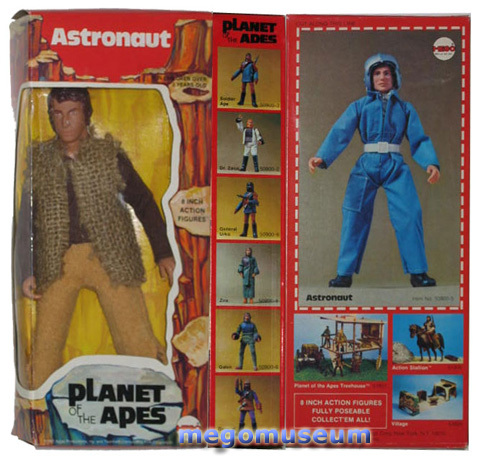 They have been factory reproduced by Classic TV Toys, EMCE Toys and Tim Mee. The CTVT reproductions are a darker brown than originals and are a little shorter with a slightly different overall shape. They are marked CTV on the inside. The EMCE reproductions fall well into the range of color shades you find originals in and the material used to make them is spot on, however, they are taller than originals. You can also notice that the original mocs were poured from the side (the minor flashing is evident) but the new EMCE versions are poured from the back. The other thing that makes the EMCE version spotable is there is a stamp on the inside of each moc. On the one I examined, one moc had the number 1 stamped in it, the other had a 4. To make matters a little more confusing, Tim Mee reproduced the Mego western line back during the Mego era using the same molds. 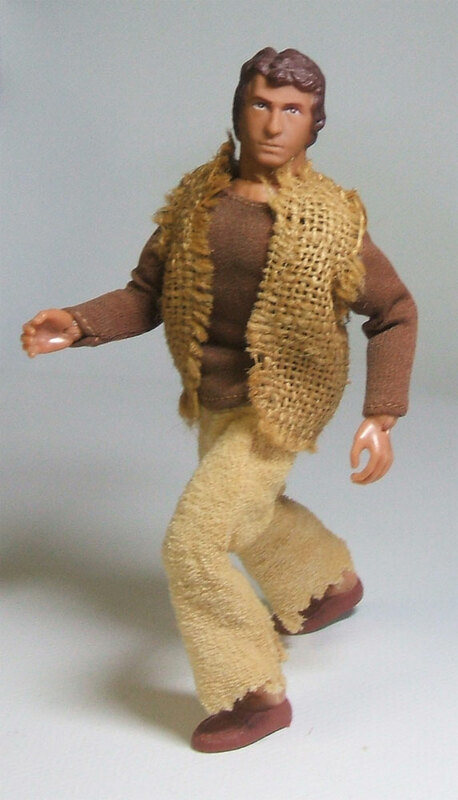 So there are vintage mocs out there that are identical to mego in almost all respects. Color, material, molds, etc… The Tim Mee mocs are just a touch thinner, making them a little more flexible than originals. The big difference is that the Tim Mee’s are marked made in Hong Kong on the bottom, while the original Mego’s are unmarked.